云南三槽四两解锭。147.85 克。地方汇款锭（三个戳记）4两银锭。官公估佘看讫，朱裕源号汇号纹银。中央有测试标志。EXTREMELY FINE.CHINA. Yunnan Sanchuo Jieding. 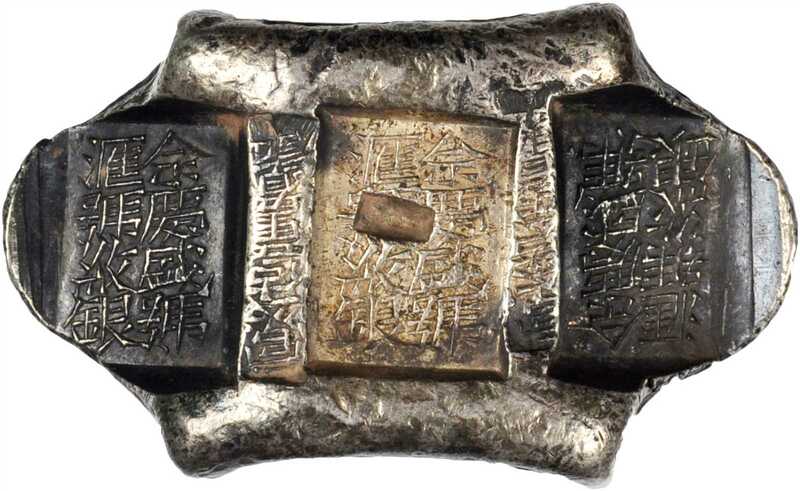 Provincial Three Stamp Remittance Ingots. 4 Tael Bank Ingot, ND.147.85 gms. BMC-Class LXVI Group I #846. "Guan Gong Gu She Kan Qi" (Checked by official public assayer She), "Guan Gong Gu Tong Kan Qi" (Checked by official public assayer Tong). "She Qing Sheng Hao Hui Hao Wen Yin" (Sheqingsheng Bank, remittance bank fine silver). Central punch test mark.